The GRIDFORM™ Design Guide is provided as a service to structural engineers to determine if GRIDFORM™ can be used as an alternative to steel rebar as the internal reinforcement system for reinforced concrete bridge decks. GRIDFORM™ is a prefabricated fiber reinforced polymer (FRP) double-layer grating, concrete-reinforcing system with integral stay-in-place (SIP) form for vehicular bridge decks. The anticipated lifespan of a GRIDFORM™ bridge deck is several times that of steel reinforced concrete bridge decks since FRP provides a corrosion-free reinforcement system for the concrete. 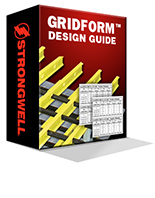 The GRIDFORM™ Design Guide program has been updated to account for deflection due to Uniform Loads. Additionally, testing of the Main Bars (GV-2) has increased the sample size to 30.